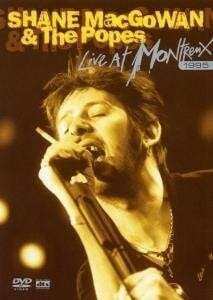 Produktinformationen "SHANE MacGOWAN - Live At Montreux DVD"
Shane MacGowan first came to prominence as the frontman and principal songwriter of The Pogues writing huge international hits such as Fairytale Of New York and The Irish Rover. After splitting from the band in 1991 he reappeared with a new band, The Popes, who released their debut album The Snake in 1995. He remains an iconic figure in Irish music. During the tour to support the release of their album, Shane and The Popes played the Montreux Jazz Festival on July 15, 1995. The show combines tracks from the Snake album such as Nancy Whiskey, Donegal Express and Bring Down The Lamp with Pogues classics such as If I Should Fall From Grace With God, Streams Of Whiskey, A Pair Of Brown Eyes and The Irish Rover along with a rousing version of the Hippy Hippy Shake that’s so good they have to play it twice! Weiterführende Links zu "SHANE MacGOWAN - Live At Montreux DVD"